The whole football world is swept up in The Alliance of American Football. And, as such, we’re going to give the people what they want. If you’ve paid attention to us the last few years, you know that we have an ELO algorithm for the NFL and the college level. We’ve applied this algorithm to some, very preliminary, data for the AAF and have power rankings for you going into Week 3 of the 10-week season. A lot of what goes into this algorithm is the preseason odds to win the AAF (via MyBookie.ag), but the results of the first few games weigh in considerably. We cannot promise that the inputs today will be the same inputs later in the season, given the nature of having only eight games to go off of, but we will be transparent about our process as always. Please send any messages to @PFF_Eric and @BenjaminBrown22 if you have any questions about this rankings today or moving forward. While we’re likely a few weeks away from having a definitive guide to handicapping the AAF, there have been some notable outcomes market-wise through two weeks. First, favorites are 8-0 straight up and 6-2 against the spread. Unders (even though totals moved about a touchdown from Week 1 to Week 2) are 6-2 as well. A team that is likely undervalued in the markets moving forward is our fourth-ranked team, Salt Lake, who have been competitive in two road losses to the league’s best team and the league’s fifth-best club. The Hotshots are the best where it matters most – earning the highest PFF passing grade through the season’s first two weeks. John Wolford is averaging over nine yards per pass attempt, generating six touchdowns to just two interceptions while enduring five drops. Cornerbacks Dexter McDougle and Sterling Moore have been very efficient so far on the defensive side of the ball, allowing fewer than 0.35 yards per coverage snap each. They go on the road to face a desperate Salt Lake team Saturday, meaning that if they get behind as they did in Memphis last Saturday, their spot atop this list might be in jeopardy. 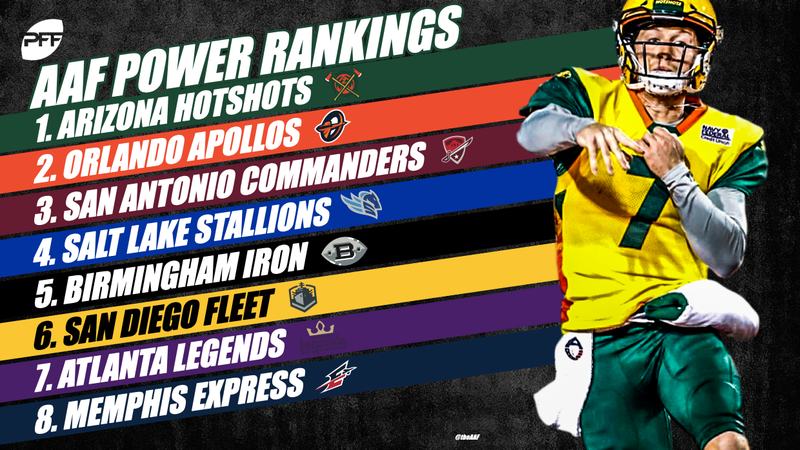 With a combined 77 total points through two games, the Apollos appear to be the offensive juggernaut of the AAF. Garrett Gilbert is the second highest-graded quarterback in the AAF through two games. His 11.7 yards per attempt are far and away the highest of any quarterback while also posting a 129.4 passer rating. Small sample size withstanding, Gilbert has been phenomenal early with the deep ball, 30.2% of his attempts have traveled 20 or more yards in the air with a 56.3% adjusted completion percentage and he has generated 313 yards of offense on such throws. Charles Johnson has been nearly perfect when targeted, posting an elite receiving grade of 90.4, his 11 receptions and 252 total yards leads the AAF. Johnson has picked up 84 yards after the catch and is posting an astonishing 22.9 yards per reception through two games. The Commanders find themselves at .500 after a shootout loss to Orlando. Logan Woodside has been competent but has operated mainly under ideal working conditions by having by far the highest percent of dropbacks from a clean pocket. Under pressure has been an entirely different nightmare with two interceptions, four sacks and only four completions on 22 dropbacks as his passer rating under pressure sits at 5.9. San Antonio has been very good getting after the quarterback in their own right with 39 pressures through two games and they have recorded 11 sacks. Tyrone Holmes, Jayrone Elliott and Shaan Washington are three of the top four edge defenders according to pass-rush grades. Combined, they have 20 pressures and six sacks and form the best pass-rush unit in the AAF. Opening as 2-point dogs in their matchup at San Diego this weekend, the Commanders offer a bit of value in early market action. While it’s a little surprising to see a winless team in this spot, but the Stallions have A) played two road games so far and B) played the league’s best team tough and lost a road game by what is likely the home field advantage in the AAF (three points). In a league where offensive linemen are at a premium, the Stallions lead so far in total pass-blocking grade. Josh Woodrum graded decent in Week 1 (68.8) but needed to sit out Week 2 with an injury, forcing them to play with third-stringer Austin Allen, who completed fewer than 50% of his passes in their loss at Birmingham. If Woodrum can return from his hamstring injury and be effective moving forward, look for the Stallions to be undervalued moving forward. The Iron got a hard-fought win Saturday against the Stallions at home, but it was not because week 1 star Luis Perez played particularly well. He averaged only 4.8 yards per pass attempt, taking three sacks and suffering from three drops. Birmingham has yet to give up over 10 points in a game so far, though, and a lot of that has to do with how well they’ve played in the second-most important aspect of football, coverage, where they’ve ranked behind only the Apollos through two weeks. The Iron go on the road for the first time this week, looking to give the Legends their third loss in as many weeks. The Fleet jumped out to a quick lead and never looked back, securing their first victory of the season over the Legends. The quarterback position could be a sore spot for the Fleet all season as neither Mike Bercovici or Philip Nelson have looked adequate through the first two games. With Mike Martz continuing to tweak and redefine this offense, expect some growing pains throughout the inaugural season. The bright spot for San Diego has been their pass-rush where they have registered 39 total pressures through two games including 11 sacks. Damontre Moore has generated pressure on over 25% of his pass-rush snaps resulting in 15 pressures on just 59 snaps. Atlanta has stumbled out of the gate behind Matt Simms’ inconsistent play at quarterback. Simms may not deserve all the blame as he has looked adequate when kept clean, posting an accuracy percentage of 72.7%. The problem is he has been under pressure on 43.5% of dropbacks, by far the highest rate in the league. Pressure has inevitably led to sacks which have completely stalled the Legends offense. Defensively, the Legends played much better in coverage and tackling than their Week 1 showing against Orlando. Oddsmakers appear to be low on Atlanta posting them as 6-point dogs at home in Week 3. It’s becoming increasingly strange to watch Christian Hackenberg toil as the Express’ starting quarterback each week. The former second-round flop by the New York Jets has completed only 50% of his passes through two weeks, failing to throw a touchdown while being intercepted once and taking six sacks. There was some life breathed into their offense last Saturday against the league’s best team, the Hotshots, helping them cover a double-digit spread as home underdogs, but they travel to Orlando this Saturday to play the other premier team in the league on the road, leaving 0-3 a likelihood for the team from Tennessee.